This paper provides a high-level overview of the functions, features, and improvements that were introduced in IBM DB2® 12 for z/OS®. These businesses gain a competitive advantage, improve business efficiency and effectiveness, and discover business insights from their existing data. The paper is intended for DB2 system administrators, database administrators, and application programmers, but might also be of interest to IT managers and executives. 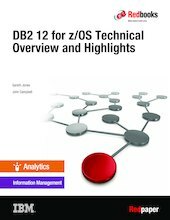 A more detailed description of DB2 12 is available in IBM DB2 12 for z/OS Technical Overview, SG24-8383.